We wrote them. You viewed them. Here are the top 10 Food Processing articles from 2008. Fourteen of the 15 largest food companies have changed CEOs in the past three years. Here’s a look at how seven of them will change the food industry. The 2008 top 100 food and beverage processing companies in the U.S. and Canada are profiled in this annual feature. Find company contact information, major brands, key executives and main product areas. Our second annual Salary & Job Satisfaction Survey's recurring theme of “More work dumped onto fewer people” continues. 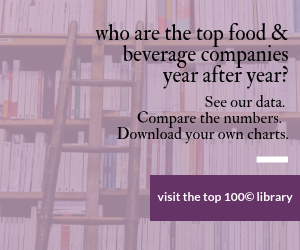 Tyson returns to the top, PepsiCo, Nestle turn in stellar years in our annual ranking of the largest food and beverage companies in the U.S. and Canada. Consumers are making choices based on sustainability efforts; here’s what the top food and beverage companies are doing. Includes bonus online content. The retail giant is beginning to scrutinize suppliers based on the scorecard and package modeling software. From heirloom potatoes and tomatoes to near-superfruits cranberries and blueberries, consumers are nuts about nature’s health benefits. This month's new product rollout features omega-3 buttery spreads from Smart Balance; heart-healthy fire-roasted tomatoes from Hunt's; new dark chocolate from Ghiradelli; pretzel crackers from Town House; and whole grain Lean Pockets from Nestle.